The final frontier is filled with wealth just waiting to be won by you! Click here to play! 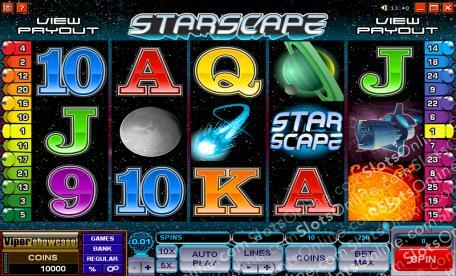 Take a trip through countless galaxies without having to leave the comfort of your own home in Starscape. This adventurous slot is played across 5 reels and 25 pay lines. The Starscape symbol is Wild and can be substituted for any other symbol except Scatters; additionally, you can win up to 70,000 coins! The Spaceship is Scattered and can appear on any lines or reels, as well as being able to payout up to 100 times your initial bet. If you manage to get three or more Scatters on the reels you will trigger the Match Bonus Game, with the chance to win up to 37,500 coins! The universe is waiting for you to discover it; there are bountiful riches to be won so start playing this exciting slot today! The Scattered Spaceship pays out up to 100:1, and if you land three or more in any one spin you will trigger the Match Bonus Game. Starscape symbols are Wild and can be substituted for any other symbol excepts Scatters, as well as paying out up to 70,000 coins. When three or more Scatters appear on the reels, the Match Bonus Game will be activated. Match four of the same symbols to win up to 37,500 coins.